We invited 80 special guests to roll up their sleeves, channel their inner brewer, and create a one of a kind cask! Enjoy a plethora of Real Ale created by our Retailers, a few Celebrities, some Media Folks, Home Brewers & our favorite Charities under the watchful eye of SweetWater’s brewers. Pre-Sale $35 online or $40 day of for unlimited Cask samples. 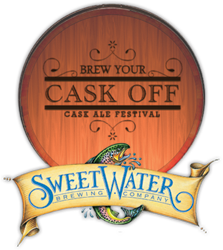 Of Course SweetWater’s award winning lineup will be flowing as well and the brewery will be open for tours throughout the event.